It has been taken for granted that the dish Bicol express originated in Bicol and is an indigenous recipe from that region. Cely Kalaw, owner of The Grove – Luto ng Inay, the restaurant that first served this fiery concoction, is actually from Los Baños. 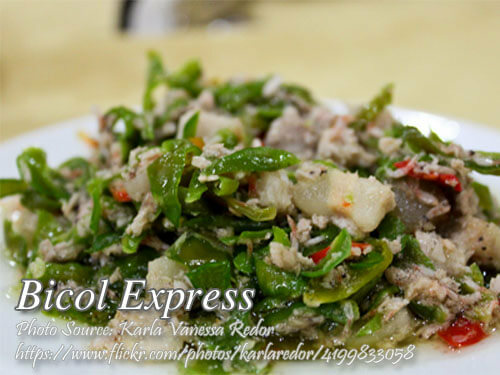 Did you know that the reason why Bicol Express was invented is because of the famous dish called laing? The restaurant owners concocted this dish because many costumers were complaining that the laing they serve is too spicy but there are also some customers who wanted to eat spicy laing. So in order to solve the problem, they cut down the peppers on the laing and created Bicol express so that they can add it to the laing for customers who wants hot and spicy laing. It has been taken for granted that the dish Bicol express originated in Bicol and is an indigenous recipe from that region. Remove stems from the green chilies and cut lengthwise to remove seeds. Slice into ½ inch pieces. In a casserole combine the pork, garlic, onion and coconut milk. Bring to a boil, lower the heat and simmer until pork is tender. Add the sliced chilies and continue cooking until chilies are soft and sauce is thickened. Add shrimp paste to taste. Bicol express is actually indigenous to the Bicol region. It was not Cecilia Kalaw who first served the concoction. Bicol express or “gulay na sili” which was what it was originally called was introduced in Manila by my father, Demetrio Kalaw. He married my mother, Milagros Estrada, who is from Iriga City, Camarines Sur. Demetrio lived in Iriga City during the early years of their marriage. He was then introduced to the Bicol dishes at that time . You see, in the Bicol region, when you say “gulay”, that indicates that the dish has coconut milk . Cooking with coconut milk and “sili” are very popular in the region. My parents first opened a small restaurant in Malate . Later on , they opened “The Grove” in Ermita, a large buffet style restaurant with numerous Filipino dishes , including Bicol express, Laing etc. The Grove was actually quite successful in the early 1970’s. Clientele included the Marcoses, celebrities, tourists. In those days before air conditioned buses were in existence . Thanks for that great info about the history of bicol express Ms Solita. That was an eye opener. I really miss Filipino food especially Bicol Express. How I wish I can have a vacation every 3 months and spend time with my friends and family.